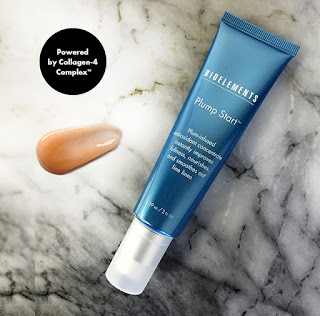 The Beauty Scoop: Bioelements NEW Plump Start! Loss of firmness? How to get plump skin. As you age, your skin gradually loses volume and fullness. Natural chronological aging brings on a breakdown of your skin’s connective tissue and the surrounding dermal matrix’s ability to function optimally, which appears via lines, wrinkles and loss of elasticity and fullness. There are also environmental factors that contribute to your skin's loss of fullness. UV exposure is the biggest environmental stressor that ages your skin, along with pollution, climate, high winds, and secondhand smoke. They all cause free radical damage and inflammation, and degrade your skin's collagen and elastic. Bioelements new Plump Start is a plum-infused antioxidant concentrate that instantly improves fullness and smooths out fine lines. Powered by Collagen-4 Complex™, this intensive plumping concentrate surges moisture deep into surface levels and soaks skin with vitamin C charged antioxidants to scavenge skin-aging free radicals. Three Australian wild plums plus a moisture-magnet marine bio active push hydration through the epidermis to help support skin’s natural volume. It’s intelligent hydration that reads your skin and penetrates where it’s needed – to visually improve the look of skin’s wrinkle valleys and crevices. In the AM, apply a thin layer on clean, dry skin. Follow with your normal daily moisturizer and broad spectrum sunscreen. In the PM, apply a generous amount to your skin before bed for an intensive overnight skin soak. Need more beauty advice? We're here to help!